(CNN) -- World number one Dinara Safina and third seed Venus Williams crashed out in major upsets at the China Open in Beijing on Monday. 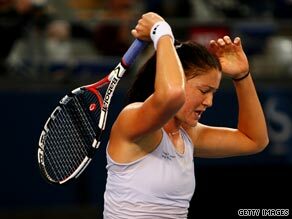 Safina shows her frustration as she crashes out of the China Open in Beijing. Venus was the first to go as she lost for the second successive week to Russian teenager Anastasia Pavlyuchenkova. The American superstar was beaten by the 18-year-old in Tokyo last week and continued her recent sorry form with a 3-6 6-1 6-4 defeat in the Olympic Tennis Center in the Chinese capital. Pavlyuchenkova twice served for victory but made no mistake at the second attempt, closing it out with a forehand winner. But while Venus was expected to find the going tough, Safina's 7-5 7-6 defeat to local wild card Zhang Shuai was an astonishing reverse. Safina has also struggled in recent weeks, but she went an early break up in the opening set against an opponent ranked 225 places below her. But the 20-year-old Zhang, cheered to the rafters by the home fans, hit back to claim the opener as service errors began to creep into the Russian's game. The second set saw a string of dropped service games, with the 23-year-old Safina unable to pull ahead as she failed to consolidate breaks by struggling on her own delivery, eventually producing 13 double faults. Zhang served for the match at 5-4, but Safina battled back to 5-5 before forcing a tiebreak. The young Chinese star gained the upperhand with strong all-court play and earned two match points at 6-4. Safina saved the first of them with a thumping forehand, but was powerless to prevent Zhang securing victory on the next point with a fine shot down the line. She slammed her racket with frustration at her latest defeat which will cost her the number one ranking if second seed Serena Williams wins her first round match on Tuesday against Russian Ekaterina Makarova, the WTA confirmed. In other matches, sixth seed Svetlana Kuznetsova cruised into the third round with a 6-2 6-1 victory over Anabel Medina Garrigues while Aleksandra Wozniak and Alona Bondarenko also made progress.